So after wrapping up my second week with Save the Harbor at All Access, I was ready for a nice relaxing weekend...until I remembered that I was going with Save the Harbor to Revere Beach on Saturday for the Sandcastle Contest. The Sandcastle Contest is very famous, and thousands of people from all over the world come to Revere to see all the different sandcastles. Sand sculptures might be a better name for them-they are so amazing to see, and it was cool to see the artists at work building their masterpieces. 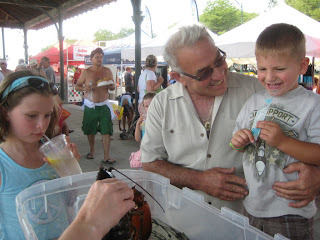 Once I met up with Aaron, Aruna, and Thi, we found a shady spo t under the pavilion and set up a touch tank with a lobster who was named Sarah by one of the many young visitors wanting to know if they could pet the lobster. Despite the heat, the kids all had a blast and a lot of people wanted to learn more about the other children's programs that we run throughout the summer. Day Two, Week Two at Piers Park! Piers Park & CSC Week Two!! A Crabby Couple of Days! Why do I come back to Save the Harbor? chnaging scenes...to the dock we go! Little Cupid is starting young! A Sea Star in Charlestown! Fishing Triumph at Harbor View! It's a rock, it's a plant, it's a BARNACLE! Week 1 at Piers Park! A bad start but a beautiful ending!